The ARTTS project is funded by the European Commission (contract no. IST-34107) within the Information Society Technologies (IST) priority of the 6th Framework Programme. 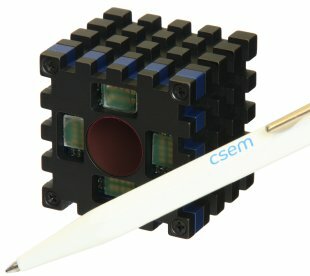 Based on a new type of award-winning sensor technology, the time-of-flight (TOF) camera, ARTTS developed algorithms and prototype systems to solve open computer-vision problems and enable new applications that involve multimodal interfaces and the sensing of people and their actions. Unlike a conventional video camera, the TOF camera delivers not only an intensity image but also a range map that contains a distance measurement at each pixel, obtained by measuring the time required by light to reach the object and return to the camera (time-of-flight principle). Intelligent recognition and tracking solutions developed for TOF cameras provide a crucial enabling technology for multimodal interfaces. The current state-of-the-art 3D TOF systems have been considerably improved so as to increase the depth resolution and quality of the signal and to reduce size, power consumption, and cost. A new prototype TOF camera has been developed and released within the ARTTS project. Advanced signal processing methods have been used to increase the quality of the signal and derive the features needed for the subsequent development of algorithms that can track people and recognize their activity. Software toolboxes for object tracking and action recognition have been developed and serve as a basis for various applications. For more information, contact us at info@artts.eu.